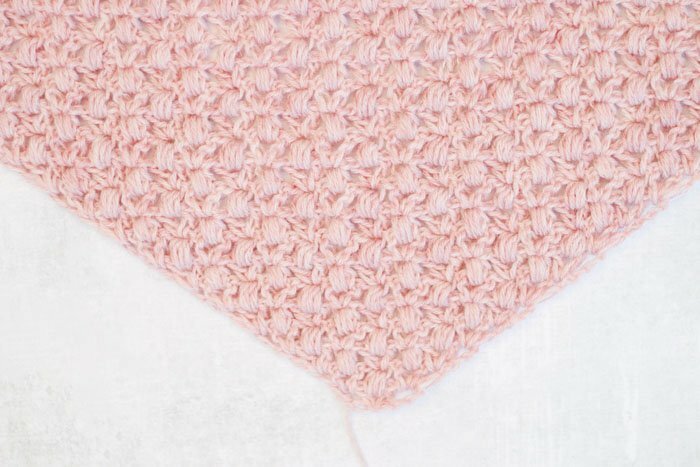 Wrap yourself in delicate softness with this surprisingly simple lace crochet triangle scarf pattern. 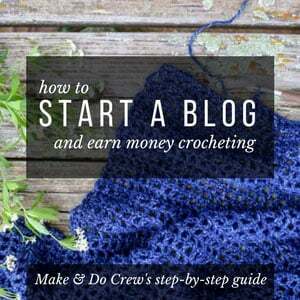 A combination of basic puff stitches and double crochets make for a romantic stitch pattern that is quite easy to memorize after a few rows. Get the free pattern below or purchase the ad-free, printable PDF for $2.75 here. 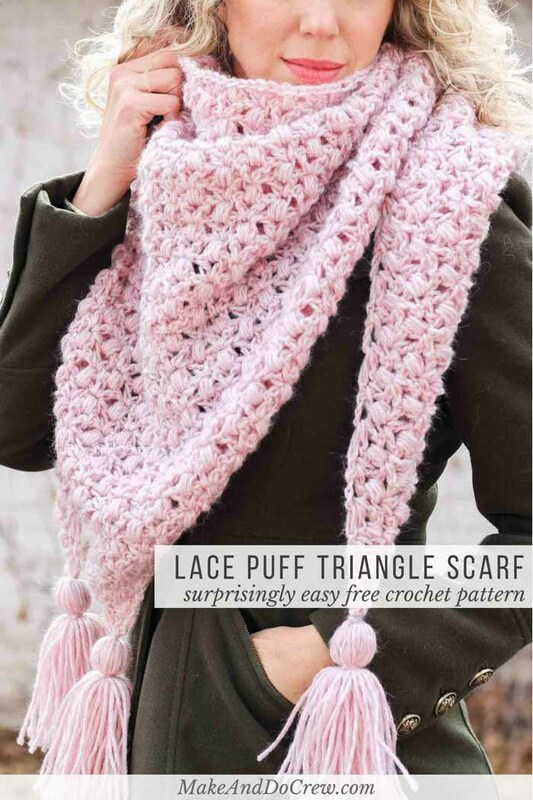 This free lace crochet triangle scarf pattern is part of an ongoing collaboration with my friends at Lion Brand Yarn. This post may contain affiliate links. That combo of delicate, but warm, but fancy, but not fussy. 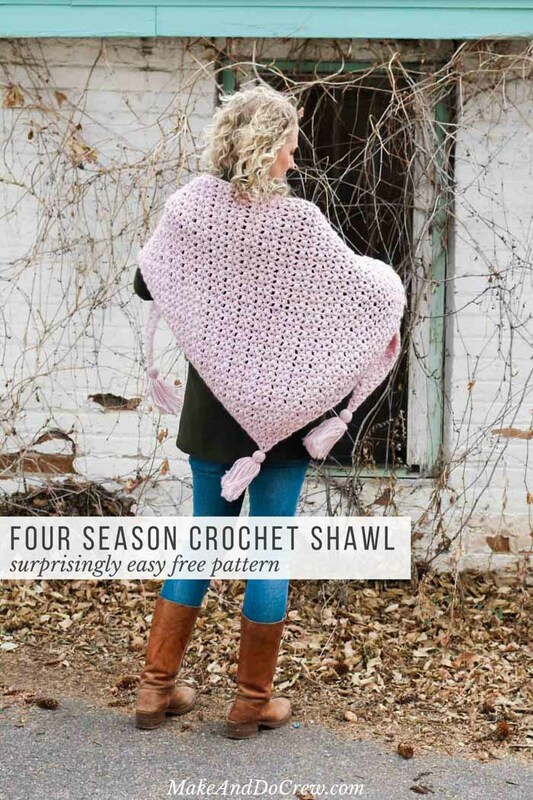 Man, it’s a tough balance to strike in a crochet shawl, isn’t it? 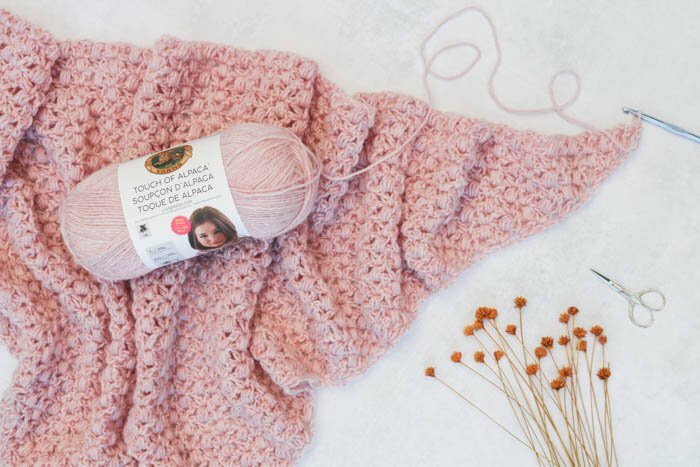 Today, I hope to to provide an answer to all your crochet scarf contradictions with the At First Blush triangle scarf. For this third free crochet pattern, I had a chance to try out the bonus bundle size of Lion Brand’s soft and luxurious Touch of Alpaca yarn. This is the same yarn I used in the free Greyscale Poncho pattern and I just love it’s easy-wearing-plus-a-bit-of-animal-fiber vibe. You can now get your own crochet-lovin’ hands on the Touch of Alpaca Bonus Bundle skeins at select Michael’s stores, Michaels.com and LionBrand.com. I’m so excited about this because these Bonus Bundles are a whole heap of yarn (415 yards!) 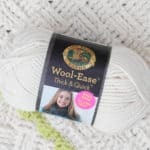 at a great price and Michael’s has been running some additional sales on this yarn lately that make it a fantastic deal. Check them out at Michaels.com here! 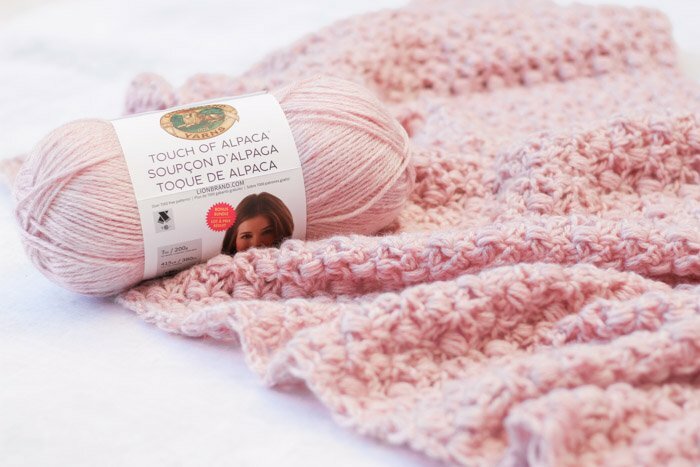 For this beautiful Touch of Alpaca yarn, I wanted to create a project that was easy enough to work on between interruptions because, let’s face it, with a two and a five-year-old may days are basically just a series of interruptions strung together. 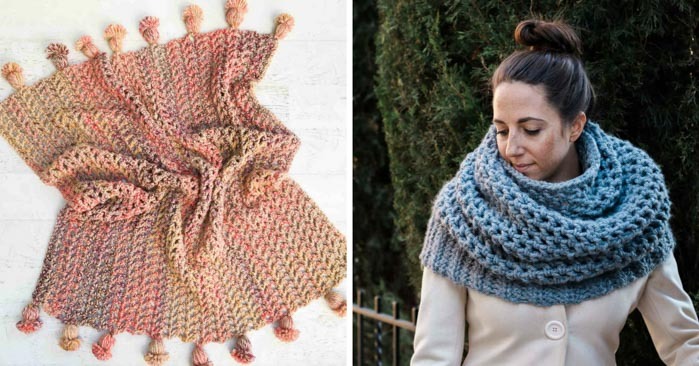 This is a project that looks like it might require some sort of magic crochet mastery, but really, it’s a perfect project to tuck in your bag and work on whenever you get a free crochet minute. And this pattern is super easy to modify the size! 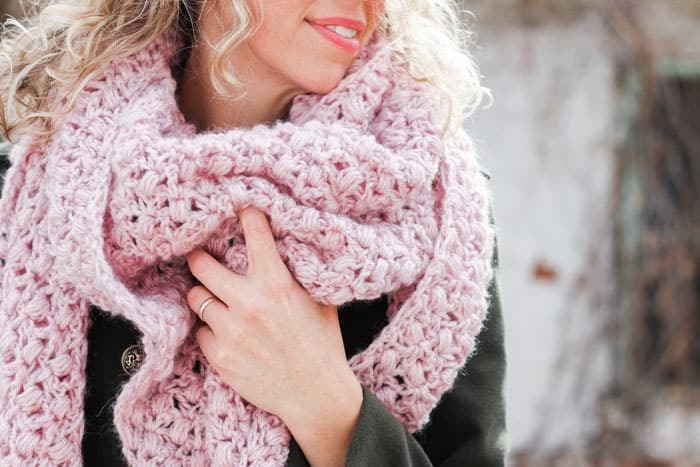 Because the lace and puff stitch repeat is the same each row, you can just continue crocheting the pattern until you have a triangle scarf or lace shawl that you like the size of. 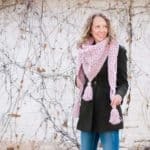 The sample size works pretty well to transition between wearing as a scarf and a shawl, but I also think making a smaller, kerchief-style scarf or a larger wrap would work beautifully. Since I know many of you are visual learners, I’ll be releasing a video tutorial for this lace crochet triangle scarf later this month. I’ve also included a stitch chart as a bonus in the ad-free, printable PDF for anyone, who like me, understands a pattern much more quickly when it’s laid out in a visual diagram. You can pick that up for $2.75 here. Lion Brand has also created a kit from this pattern (always an honor!) that includes all the yarn you need for the project, plus a printed copy of the pattern. You can pick up your own kit here. Add this pattern to your Ravelry queue and favorites here. 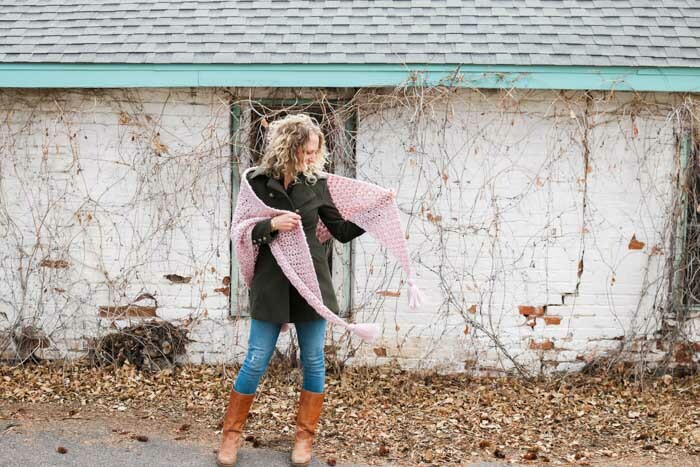 Wrap yourself in delicate winter lace with this surprisingly simple triangle scarf pattern. 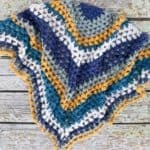 A combination of basic puff stitches and double crochets make for a romantic stitch pattern that is quite easy to memorize after a few rows. 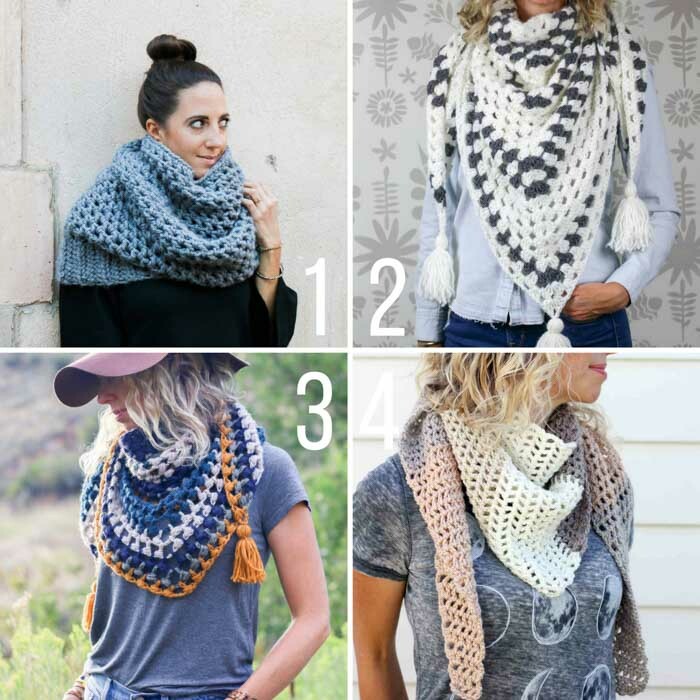 Whip up some smaller scarves for easy gifts or work additional rows to make a longer shawl. The Touch of Alpaca yarn makes for a lightweight, flowing piece that still maintains lots of coziness. • The sizing of this scarf is very flexible. Just continue working the pattern until the triangle is the size you’d like. • Ch 4 at beginning of each row counts as 1 dc and 1 ch1sp. • Work first 4 ch of each row and the last 2 dc of each row quite loosely to be certain the edges of the triangle lay flat. Puff Stitch: [yo, insert hook in st and draw a long loop up through] 4 times in same stitch, yo and draw a loop through all 9 loops on hook. Each puff stitch is always followed by a ch 1 to close the puff. Row 1: Sk first 5 ch, work [dc, ch 1, dc] all in the sixth ch from the hook, ch 1, sk 1 ch, dc in last ch; turn. Repeat Row 4 until scarf reaches 44 total rows or desired size. Fasten off and weave in ends. See photo above for a visual tutorial. 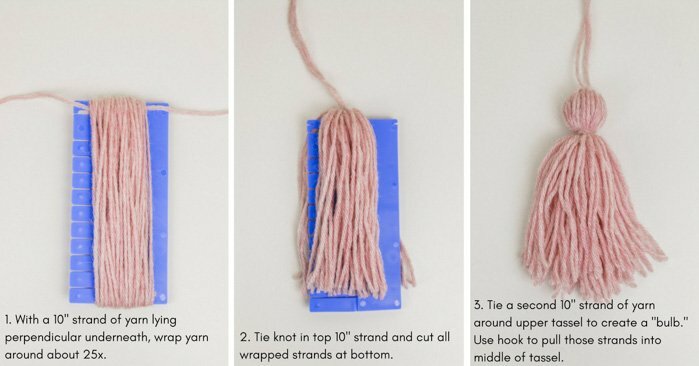 Using MC yarn and a cardboard tube cut to 6” (or a tassel maker), wrap yarn approximately 50 times around the tube lengthwise. Insert 10” strand of yarn underneath wrapped yarn on one end of the tube. Tie a few secure knots, but do not trim these pieces. Use scissors to cut the wrapped yarn at the other end of the tube. Fold the resulting strands of yarn in half and wrap a 10” piece of yarn around the top of the strands to create a small sphere of yarn. Insert hook through bottom of tassel to grab these tails and hide them in the tassel. Envelope yourself in puffy alpaca lace and hit the ballet, a secret garden or the grocery store in style. Very pretty Jess! Love it so much. I cannot find a link to your diagram version (the provided link opens the LionBrand page where the diagram + the yarn is to sell). Can you please provide it? You can purchase just the pattern with the bonus diagram for $2.75 here. I think that’s what you’re looking for? Please lmk if not! Yes, that is what I am looking for – as I already bought the yarn at Michael’s – but I cannot find it (and i really look forward to beginning!). Can you provide me with a link to the pattern + diagram at $2.75? (It is sold with 2 balls of yarn only on the LionBrand Website). Looks a lovely stitch, is it possible to do this in a rectangle shape? This triangle scarf is beautiful. I’ve started it a few times now but I’m really not sure in doing it correctly. I’m looking forward to your video tutorial I do so much better with visual learning. I thank you for your time in sharing this with the public. This looks so nice perhaps my level!! Hi! Just wondering if you know about how many yards you ended up using. I have a beautiful yarn I’d love to use, and have about 700 yards, but wondering if that will be enough. I can also make the tassels out of something different, which actually might look really nice with the yarn I have. Anyway, just hoping for a close guesstimate…? A trip to see the Lion Brand Studios in New York is a dream of mine!! They have so many beautiful lines that we don’t get here. Plus working with them as a designer. What a dream come true! Congratulations! That’s an amazing accomplishment! That looks so incredibly beautiful and soft. Wow! Hard to believe that’s a worsted weight yarn as the shawl looks so delicate and flowing. I never would have chosen that color on my own, but I just love it in your shawl. Thank you for the pattern with its appealing mix of stitches that make it look both classy and challenging. Disappointed that the explanation of the puff stitch not provided and that it would seem that I need to make a purchase to know how. The puff stitch is explained in the “Abbreviations” section. I’ll also have a free video tutorial coming out for this pattern by the end of the month. Dawn. Hi Jess sounds like your having a great new year.Thankyou for all your wonderful project s just love them and easy for me to follow. Thanks again and God bless. That color looks awesome! I am not usually a pink girl but I think I am gonna check that yarn out on my next trip!